Trainz.com Blog: The Christmas Story Sets are here! The Christmas Story Sets are here! Just in time for Christmas, we have received Lionel's O Gauge Christmas Story train set. I just finshed adding them to our system, and they will show up on the website later today. This is another addition to Lionel's recent run of 'themed' starter sets, along the same lines as the Polar Express and Harry Potter train sets. 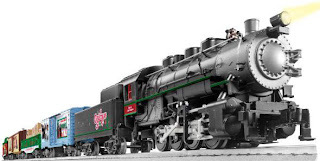 The Christmas Story set uses the standard 0-8-0 steam engine with smoke and whistle, and has four cars decorated for various scenes from the famed 1983 film. It also includes the standard CW80 transformer and loop of FasTrack. It is definitely an eye-catcher and will gain attention circling around under tree. Even better, if any of your Christmas guests see the train and wonder what 'A Christmas Story' is, you can flip over to TBS while asking them what rock they've been living under for the last 15 years. We have them for $264.99 with free shipping on our site. Hurry, quantities are limited and we only have a few left after filling preorders. Also, the Lone Ranger Wild West set and the Amtrak HHP-8 sets are also now available. We have the Lone Ranger set for $354.99 and the Amtrak set for $424.99. The Lone Ranger set has Trainsounds (I am curious how Lionel fit the Trainsounds speaker and circuit boards into that small Old West-style tender) and a lot of action. The Amtrak set has Trainmaster Command control, but does not have Trainsounds (the engine has a horn). The Amtrak set is one of the most up-to-date sets produced by Lionel and is a great choice for a fan of contemporary railroading. Like the Christmas Story set, quantities of these top-of-the-line sets are limited. UPDATE: The links off of our train sets page were not locating the sets yesterday. It has been fixed.